What comes to mind when you think of braces? Often, people think of painful metal brackets, rubber bands, and years of discomfort and embarrassment. That’s where Invisalign comes in. Invisalign’s patented technology removes the pain and the embarrassment of having your teeth straightened. They’re “clear braces” in a sense, but no brackets are involved. Custom, clear plastic retainers are given to you for two week segments; each is designed to move your teeth gradually toward the alignment you desire. In fact, if you’ve ever had your teeth whitened, Invisalign will look familiar. The custom Invisalign retainers you wear are very similar to teeth-whitening trays. Eating and drinking isn’t a problem either; you can easily remove the Invisalign clear braces while you eat, and slip it back in when you’re done! Most teens and adults (those who use braces most commonly) hate the stigma that comes with having braces. Compare the difference in the photo above — what would you rather look like as you straighten teeth? For most, the difference is clear. Invisalign not only gets results, it does it while preserving your natural smile. Have your teeth shifted but you don’t want braces again? Invisalign clear braces are also an excellent way to straighten teeth that have shifted over the years after metal braces were removed. It is common for people who have had braces to experience their teeth moving back to the original, misaligned position. The last thing most people want is to put brackets on again. That’s why many people in this situation choose Invisalign; they can straighten teeth without going through the experience of braces for a second time. The future of teeth straightening is here: it’s Invisalign. Dr. Stewart and Dr. Hull have been trained in Invisalign dental technology. In addition, they attend many continuing education courses in Invisalign annually so that they keep up to date on this fast-changing technology. We are exicted to have the Itero Element digital scanner to make Invisalign treatment easier and even more comfortable! This 3D scanner takes a digital image of your bite instead of requiring you to sit in the chair for a while with impression material pressed against your teeth. 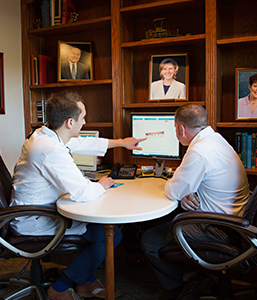 The digital scan is also seamlessly integrated with the Invisalign software so there is no waiting for plaster models to be created and then mailed to a lab for your clear aligners to be created. Come see for yourself! 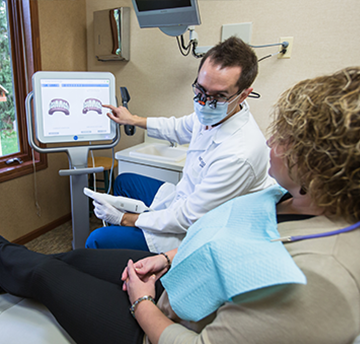 Getting straight teeth has never been easier than it is at Stewart and Hull in Comstock Park. If you are considering braces, we’d love to have you come in and talk with us about Invisalign clear braces. Straight teeth are one very important aspect of a beautiful, healthy smile, and there’s no better way to straighten teeth than with Invisalign. Just listen to what Erin, one of our patients, has to say about her experience with Invisalign clear braces in the video below. Call our Comstock Park office today to schedule and Invisalign appointment with us if you are in the Grand Rapids or Rockford, MI area!